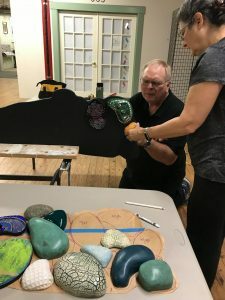 Tom Quest and Marcia Joffe-Bouska mounting "river stones" to plywood supports for their collaborative exhibition "Rivers." Artists Lori Elliott-Bartle, Marcia Joffe-Bouska and Tom Quest first collaborated back in 2015 to create an exhibition titled "Rivers, Roads, Remains." Their latest collaboration, "Rivers," is the result of a year spent taking the initial ideas and work in "Rivers, Roads, Remains" and creating a new body of work. "Rivers" will be on display at the W. Dale Clark Main Library's Michael Phipps Gallery from Friday, Nov. 3 through Sunday, Dec. 31. Click here to learn more about "Rivers." Lori Elliott-Bartle focuses on aspects of landscape, and especially the prairie. Each day, she looks at the patch of big bluestem growing in her small, urban front yard to remind her of the resilience and subtle beauty found in native grasslands. Her work is often abstract, and she uses a wide range of materials. She mixes softened beeswax with oils and pigments and applies many layers to create paintings that hold depth, complexity and texture. She uses rollers, wide blades and brushes to apply paint; then she blots, scrapes and carves with knives and points to reveal underlying colors and to convey motion and emotion. She sometimes includes old maps or textured and printed papers to invite viewers into a story. Marcia Joffe-Bouska's mixed media artwork is vibrant with color, pattern and texture—quite different from the airbrush paintings of her early career. She incorporates glass mosaic, fused glass, found objects, and traditional and nontraditional materials and techniques. Rich in symbolism and visually arresting, Joffe-Bouska's artwork is complex and layered with meaning. Her artwork also investigates universal themes of relationship and nuances of the human condition, as well as finding inspiration and reference in the natural world. She considers her work to be her interface with the world around her, and her way of seeking meaning in the most mundane of experiences–a way of making sense out of life. Tom Quest is a multi-media craftsman specializing in clay. His forms and molds are hand-made, allowing the clay bodies to take various shapes. Additionally, his stamps are crafted through wood burning and carving. He explores how textures integrate with form while experimenting with glazes to further enhance the topography of his works. His organic shapes and forms are reflections and abstractions of the natural world.